They don't come cheap but these are a potential best friend for life. Sound is superb. Unobtrusive looks. Comfortable to wear. You're probably more familiar with ACS in-ear 'phones than you might think. Chances are if you're watching the good and the great belting it out on TV they're wearing ACSs in their ears. Or fashionably draping them around the neck. 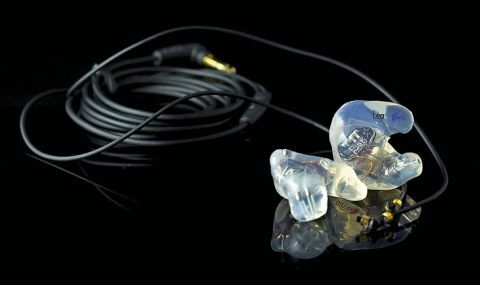 "The sound is remarkable - the best in-ears we've ever tested - which is only made more impressive given their invisibility"
These are custom 'phones - buy online and you'll be directed to all the places in your area that can takemoulds of your ear canals. Even larger branches of Boots will do the job. Wearing is a breeze and once in place the soft silicon fits undetectably and stays put, flexing slightly to give a snug fit as you move. Kevlar coated (replaceable) leads stay untangled and feel predictably bulletproof. The sound is remarkable - the best in-ears we've ever tested - which is only made more impressive given their invisibility. The T1 Live! we tested employs three drivers inside each ear's nugget delivered by two tiny sound holes, delivering bass levels that - when pushed with EQ - genuinely sound like full-size phones. Out of the box response is very flat but treat them to a little EQ and top and bottom really sing out. The T1 Live! are ACS's latest models and - incredibly - even include microphones in each ear to provide ambient feedback alongside the direct signal. No more draping one around your neck if you feel too disconnected from the band. Right now these mics are dormant, as an Ambient Processor unit which uses them is 'coming soon'.